Support for the Teensy3.1 & 3.2. Teensy3.1 & 3.2 boards are development boards made by PJRC. 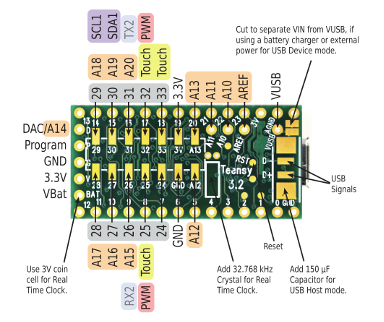 Teensy3.1 & 3.2 boards are built based on the Freescale MK20DX256VLH7 microcontroller. See Datasheet. Put the board in bootloader mode by tapping the reset button. The board should remain in bootloader mode until flashed. To access the STDIO of RIOT, a FTDI to USB converter needs to be plugged to the RX/TX pins on the board (pins 0 and 1 of the board). 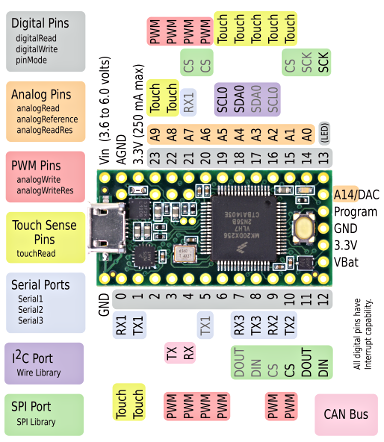 Board specific definitions for the Teensy3.1 & 3.2 board.